As we spend one third of our lives sleeping, you will agree itâ€™s worth investing in our bedroom. Whether you are remodelling your bedroom with new everything, or looking for some new accessories, you'll find big saving on the site. You may envisage urban chic, country cottage, Japanese infusion or boutique as a theme for your bedroom and know exactly what duvets, pillows, sheets and blankets to buy or you are maybe browsing the site for inspiration. Great deals from Heals, Debenhams, John Lewis, Marks and Spencer and Tesco. Silentnight So Cosy Pillows 2 + 2 Free! 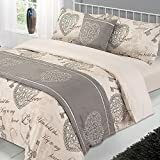 Silentnight Warm and Cosy 13.5 Tog Duvet Double.